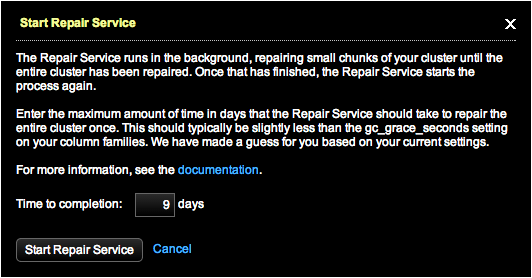 Configure the days for the repair cycle to complete and start the Repair Service for a cluster. The Repair Service takes a single parameter, time_to_completion, which is the maximum amount of time it takes to repair an entire cluster one cycle. In a multi-datacenter environment, the NetworkTopologyStrategy is required as the replication strategy for all keyspaces to run the Repair Service. The Repair Service will not run with SimpleStrategy. Prompts guide you to change the strategy from SimpleStrategy to NetworkTopologyStrategy when necessary. In the Start Repair Service dialog, enter a value for Time to completion field. The default is 9 days. Typically, you should set the Time to Completion to a value lower than the lowest gc_grace_seconds setting. The default for gc_grace_seconds is 10 days. The Repair Service starts up and updates its status after one minute and every minute thereafter. A progress bar displays the percentage complete for the currently running repair.